Once upon a time, there were three little pigs, named Peter, Patty and Penny, who left their mommy and daddy to see the world. All summer long, they roamed through the woods and fields, playing games and having fun. 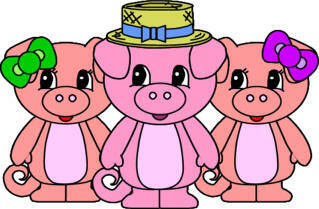 None were happier than the three little pigs, and they easily made friends with everyone they met. Wherever they went, they were given a warm welcome and never had to worry about where they would sleep. But as summer drew to a close, they realized that people were starting to prepare their homes for winter. The three little pigs decided that they too needed a home of their own to keep them safe and warm through the winter.